In 2014, after years of professional interaction and deep friendship, Justin Lucero of El Paso and Megan McQueen of Las Cruces founded Scaffolding Theatre Company. but most importantly, we wanted an outlet where the rehearsal room process demanded just as much passion and attention as the opening night performance." 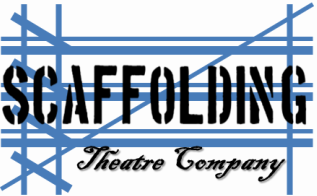 The mission of Scaffolding Theatre Company is to produce musicals uniting experienced musical theatre performers with promising novices, accompanied by professional musicians, with a focus on process as much as product. Megan gained extensive producing and performing experience while earning a Bachelor of Music degree with honors from New Mexico State University. After several years as a freelance producer and performer, she earned her Master of Arts in Education from NMSU while teaching at Alma d’arte Charter High School in Las Cruces, New Mexico over 8 years. She then worked as Centennial High School’s first theatre and dance teacher. While serving on the faculty of NMSU for five years, Megan not only taught THTR 101 and Acting for non-majors, but also The Art of Theatre and Musical Theatre for theatre majors while music directing A Christmas Carol, The Mystery of Edwin Drood, The Drowsy Chaperone, Urinetown, and Rent. She has performed over 20 musical theatre roles for companies in New Mexico, Pennsylvania, and Massachusetts. Favorites include Svetlana in Chess, Fosca in Passion, and Claudia in Nine for Ephrata Playhouse in the Park in Pennsylvania; Anna in The King and I, Rona in …Spelling Bee, and Nellie in South Pacific for UTEP Dinner Theatre in Texas; Miss Hannigan in Annie for Las Cruces Community Theater in New Mexico; Sally Bowles in Cabaret for American Southwest Theatre Company in New Mexico; the baroness in The Sound of Music, Cherubino in The Marriage of Figaro, Aldonza in Man of La Mancha, and The Witch in Into the Woods for Doña Ana Lyric Opera in New Mexico. As Artistic Director of Boba Cabaret, she produced, directed, and often performed in revues (a total of 28). Having worked on an average of seven productions a year for the last 20 years, her favorite include directing the world premiere of We are Enron and directing / music-directing The Full Monty. For her contributions to the Las Cruces area, Megan was honored to be included among the Southern New Mexico Women of Distinction in 2014 and with the Community Artist Award by Doña Ana Arts Council in 2016. Justin trained in London at the University of Essex’s East 15 Acting School (rated as the number one school for drama in the UK by The Times) earning an MFA in Theatre Directing with Distinction. He is currently in his second year as the inaugural Cynthia Woods Mitchell Fellow in Directing as part of the faculty of the University of Houston’s School of Theatre and Dance. He teaches Advanced Directing, Collective Creation, and senior Theatre Education courses and has directed their productions of Brecht’s The Caucasian Chalk Circle, Luchadora! and numerous plays for the UH 10-Minute Play Festival. Justin is also Artistic Director of El Paso Opera, where he serves as resident Stage Director (Humperdinck’s Hänsel & Gretel, Mozart’s The Magic Flute: In Concert, Bernstein’s Trouble in Tahiti), Director of the Young Artist Program, and heads its Community Engagement initiatives. He has been the recipient of a Directing Fellowship with Asolo Repertory Theatre (Florida), a Stage Directors and Choreographers Foundation Observership at South Coast Repertory (Los Angeles), a 2016 FAIR Assistantship with Oregon Shakespeare Festival, and a Directing Attachment at Regent’s Park Open Air Theatre (London/West End). Justin regularly directs for the UTEP Dinner Theatre (Anything Goes, South Pacific starring Megan McQueen, and Hello, Dolly!) and has a long-standing relationship as an Artist-in-Residence with UTEP’s Department of Music. Other directing credits: Arsenic and Old Lace (Creede Repertory Theatre); Hamlet (Asolo Repertory Theatre); The Liar (FSU/Asolo Conservatory for Actor Training); Opera Bhutan: Acis & Galatea (as Associate Director for this world-premiere Smithsonian Institute co-production, the first-ever opera produced in the Himalayan Kingdom of Bhutan). He is a certified Texas K-12 Theatre Arts teacher and an Associate Member of the Stage Directors and Choreographers Society (SDC), a national theatrical union.